This is the official site dedicated to providing information and contact details for clubs, societies, and related commercial organisations in New Zealand. The common name of Tea Tree derives from the practice of early Australian settlers of soaking the leaves of several species in boiling water to make a tea substitute. It is a lovely tree, with flowers which resemble tiny wild roses and spiky little evergreen leaves. The bark looks old rapidly, although it may take a while to thicken the trunk. Although a large tree normally, Metrosideros excelsa also responds well to Leaf and root pruning and can be used for Bonsai. As they grow quite quickly they require regular pruning to maintain their shape and because of this they tend to be hard to get to flower as bonsai. If you can forego pruning for a year or two and risk loosing shape and instead get flowers a great christmas floral display. They will bud from old wood so shape can usually be regained. Learn to create bonsai from New Zealand native trees & Beginners guide to the use of bonsai tools and wire to style your trees. In 1989, at the age of 20, Bill suffered a severe head injury in a traffic accident. This left him with restricted use of his left leg and arm and a short term memory problem. 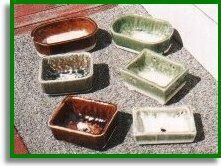 Despite this Bill's strong interest in Bonsai has led him into making pots for Bonsai. So how do you make a reasonable looking pot with the use of only one hand? Not easily! After a lot of frustration and failure Bill is now able to make pots from start to finish without any help. The finished products are pleasing and give Bill a great sense of purpose and achievement. First established in the 1960s as a traditional Victorian flower garden of annuals on what had been the city rubbish tip. They now cover 58 hectares of well maintained public parks and gardens beside the slow moving Waikato river. Included amongst these garden collections are "The Chinese Scholars Garden" (A traditional Chinese Garden from the Sung Dynasty, 10th-12th Century), and "The Japanese Garden of Contemplation" (A traditional Japanese Garden from the Muromachi Period, 14th-16th Century demonstrating three forms of garden as a place for quiet contemplation and study). The gardens are located on Cobham Drive (State Highway 1) within five minutes of the city center and are open seven days a week from 10 am till 4 p.m.